Foster Botanical Gardens is one of five botanical gardens in Oahu. The five are an amazing show case of rare plants and exceptional trees. Probably, the largest variety of plant life anywhere in the USA. Got plans to visit Foster Botanical Garden in Honolulu? Go prepared and research it first. You'll find information on the Friends of Honolulu Botanical Garden website as well as the Aloha Hawaii website. ... Weird and wonderful any way it's dressed up. One of the most fascinating trees ever. It's quite peculiar and it lends itself to any photo editing style. I edited two different versions of this cannonball tree. In the first, I used two textures and two vignette layers and I made the scene dark and mysterious. It's a fantasy landscape in my imagination. This second version is what it looks like in the garden on a sunny day... as it mostly is in Honolulu. Even though it's 'reality', I still find the tree fantastical. 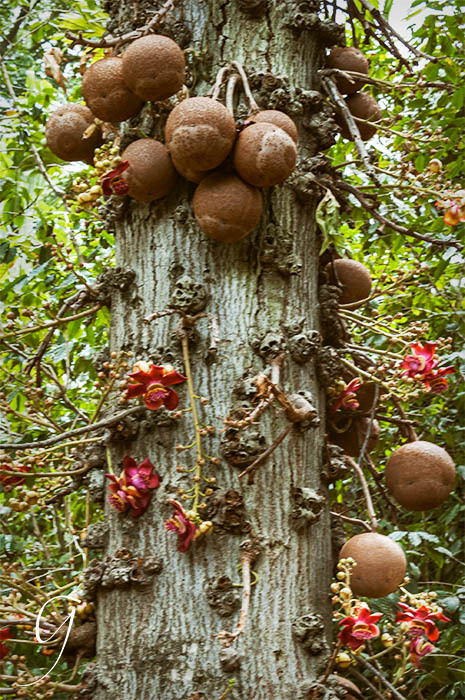 The cannonball tree is an evergreen and it's a member of the Brazil nut family. The flowers grow out of the tree trunk and they smell sweet but don't go close and sniff the fruit... it's gross. All parts of the tree have a part in naturopathic medicine. They seem to cure a number of afflictions... stomach aches, malaria, bronchitis, colds, toothache and it's also a disinfectant for wounds. A handy tree, indeed! If your dog has mange, it will cure him, too. Meet the Kapok tree below... what fabulous character! I want to wrap my arms around it.... but my arms aren't long enough! Yes ... I proudly confess to being a passionate tree hugger. 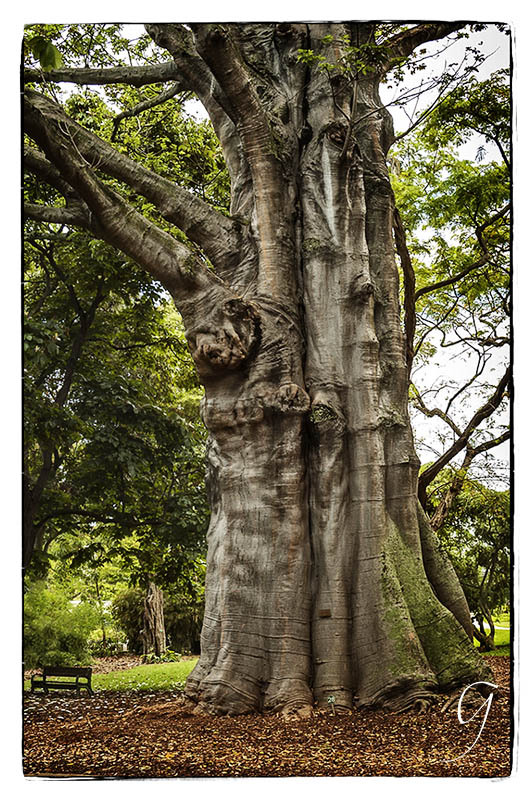 One of the massive Kapok trees at Foster Botanical Garden in Honolulu. HDR exaggerates the texture in the bark. I included the park bench for perspective. Gnarls, bumps, feet, hidden faces... all there. See them? They popped with a magical process - HDR. Amazing detail! This curious tree was planted around 1853, which makes it more than 150 years old. 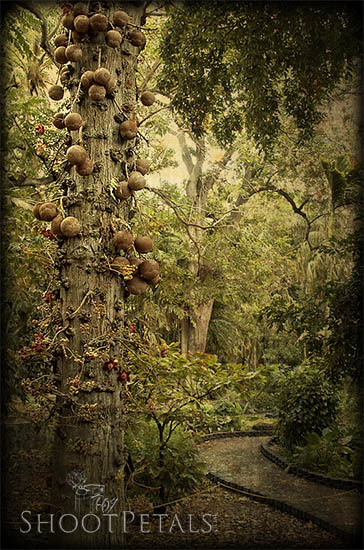 The Kapok can grow 15 feet in a year and it looks like this big fella did! The itsy-bitsy park bench isn’t a toy. It's there to give you some perspective... to show how massive the tree is. I sat right on that bench, looking up to the top of the tree... and I mean a l-o-n-g way up! Photoshop is my go-to photo editing program. HDR can look surreal if you push the limits. I don't usually like surreal... I just use it to bring out detail. If you shoot HDR in camera, you'll need a tripod. Take at least 3 images... meter and shoot your 1st image, then shoot 1 stop under-exposed and another 1 stop over-exposed. All shots have to be in exactly the same position or the software can't line the images up correctly... that's why you need a tripod. There are photo editing software programs totally devoted to merging to HDR but I use Photoshop. It's effective and I don't have to buy another program. If shooting HDR becomes a habit with you, invest in a program. Test drive a couple before you put your money down. Most people take photos of Buddha from the front. But if I took a picture of his beautiful face, that would mean the stone lantern, or doro, isn't included. And it's significant to my photo. Each part of a doro represents one of the 5 Buddhist natural elements. The base is earth, the pedestal's water, the part that contains the flame is fire, above that is air and the very top portion, closest to the sky, is spirit. A garden doro knows how brief life is. It sits there in the garden experiencing the 4 seasons again and again. It sees the cycles the flora and fauna go through. And their passing. The beautiful, sweet smelling flowers, people appreciating the garden, singing birds, pollinating insects... they'll all end in Death. Buddha sitting in lotus position. Viewed from the side to include the stone lantern, or doro, that Buddha is looking at. I didn't take this shot from the front because Buddha's serene face isn't the story I wanted to tell. No stone lantern would have missed the story. And every photograph has to have a story. 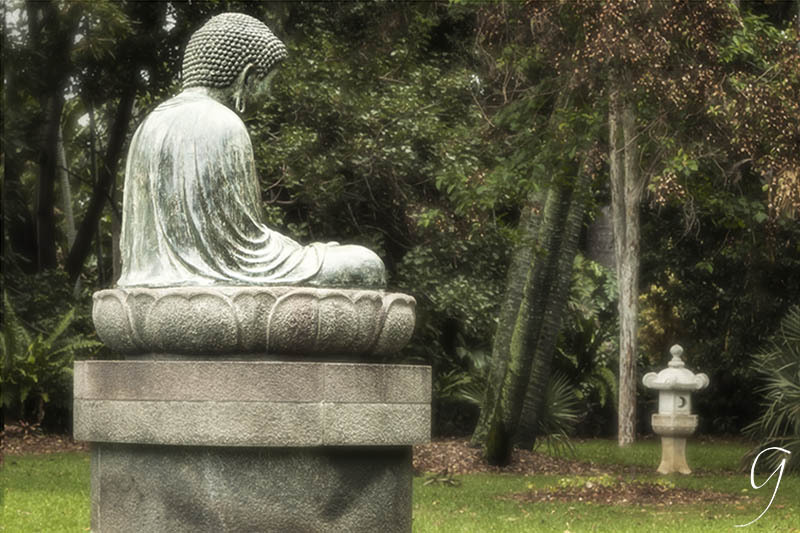 In this photo, Buddha is contemplating the doro across the lawn. Since you know the symbolism of the stone lantern now, you understand the story of this photo. earthly bodies and the transcendence of our souls. What better place to experience the natural cycle of life and death than in a garden? Just beyond Buddha is the Conservatory. Inside is a gorgeous collection of orchids. An excellent opportunity for orchid photography. Make sure you've got your tripod and lots of time. Phalaenopsis orchids in the conservatory at Foster Botanical Garden, Honolulu. I used painterly textures in Photoshop. Both of these are phalaenopsis orchids. I loved the contrast of white with the smaller bright violet blooms. 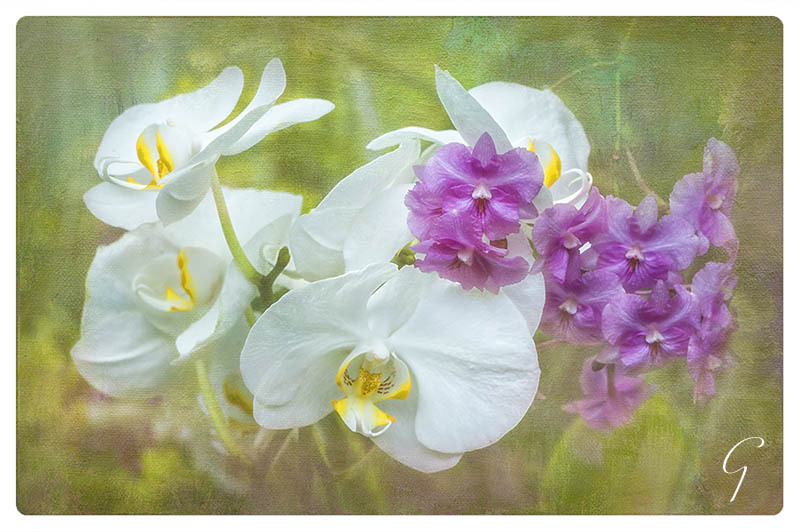 The orchids in the bottom left were brilliant yellow and I used textures from French Kiss to give this photo a painterly look . 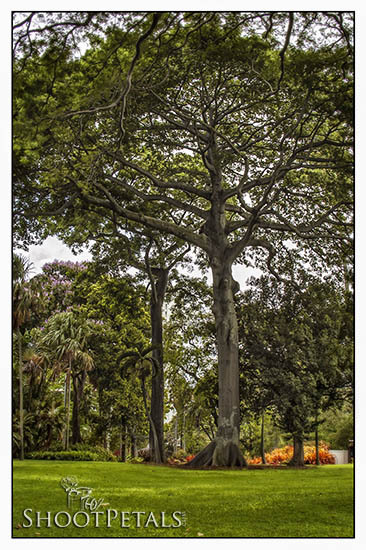 Even though Foster Botanical Garden is fairly small, it's home to 25 of the 100 exceptional designated trees in Oahu. The original site was only 5 acres in 1853. In 1930 the garden was entrusted to the city of Honolulu and after that it gradually sprouted to 14 acres. Yes... small, but it's home to so many rare plants and historically meaningful trees. After 1930, thousands of non-native plants and trees were imported for the garden... a diverse range of subjects here to photograph. It's only 1 of a group of 5 exceptional botanical gardens in Honolulu... a garden oasis just outside Honolulu's downtown area. 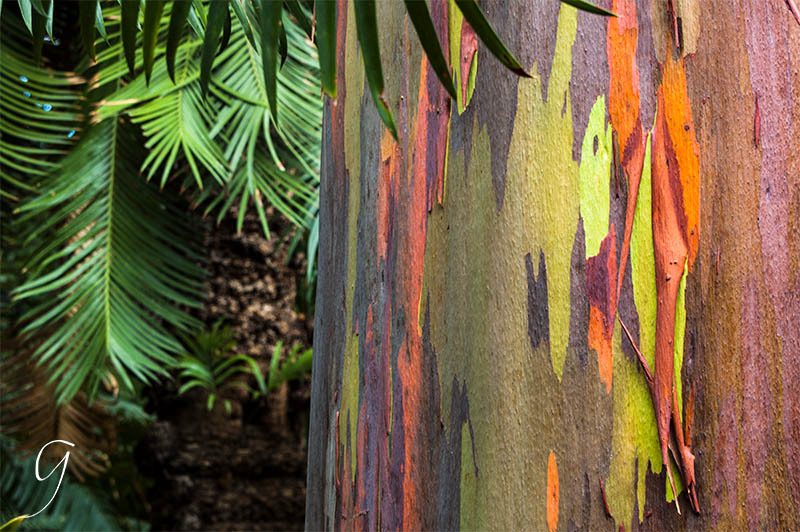 The colorful bark on the trunk of a Eucalyptus tree at Foster Botanical Garden, Honolulu. A touch of HDR added in ON1. The trees in this garden make awesome subjects for photography. My next favorites were the orchids in the conservatory, but there's also an outdoor orchid garden I didn't have time to take in. I only had a few hours one afternoon to spend here but next time, I'll plan a whole day. There's so much more to photograph. A peaceful, inviting garden. A perfect environment to relax and focus all your attention on the process of garden photography.